The Thatched Cottage dates back over 200 years and provides compact, unfussy but comfortable accommodation. 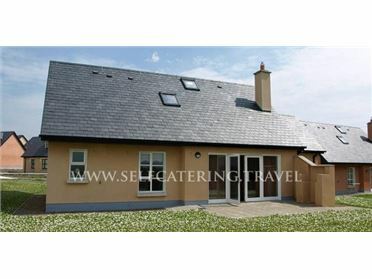 This traditional style Irish cottage is situated on the outskirts of the rural hamlet of Drummin just 10 miles from Westport in County Mayo. The accommodation has a number of charmingly quirky features including sloping floors, low doorframes and a traditional Irish fireplace with wood burner. The Thatched Cottage has an open plan living area, family bedroom and one smaller bedroom and a lawned garden with seating where you can relax and enjoy beautiful views of the nearby mountains. Winding leafy lanes, honeysuckle and wild roses in season, hilly areas and incredible views characterise the rural village of Drummin 10 miles south of Westport in County Mayo. Take a walk to the top of the hills to enjoy the breathtaking panoramic views across Clew Bay to Clare Island, once the stronghold of GrÃ¡inne Uaile, the Pirate Queen. There are many fascinating and beautiful places to visit in this part of Ireland. Go fishing in the rivers such as the Erriff River around eight miles away, and the Delphi River in the Doolough Valley, about six miles away. The lively town of Westport nearby is proud of its rich Irish heritage and offers an excellent selection of shops, restaurants, pubs and traditional music. If you love the outdoors, head for nearby Croagh Patrick and its bracing hikes and spectacular views. County Galway is just over 30 minute's drive away to the south, and offers a wonderful day out, with glorious coastal scenery and the world-famous Connemara National Park.